Donations will be accepted during the concert as well. Please join us as we support the Anderson family financially and in prayer. Carson Anderson is a 15 year old young man who has a bright future and is the kind of son everyone wants to call their own! He has a passion for soccer, God and his family. He is an upcoming soccer star that is already being scouted by several colleges. 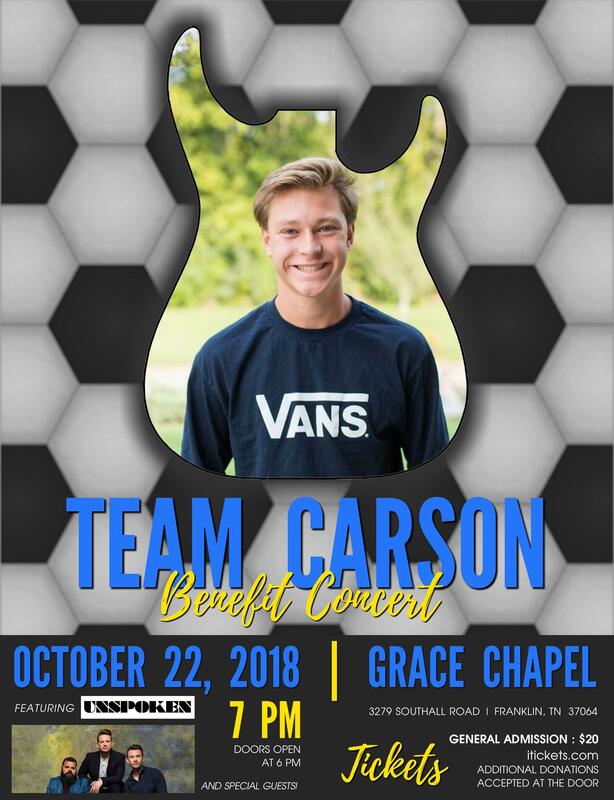 On September 7th, 2018, Carson was diagnosed with Ewing Sarcoma (bone cancer) in his left foot that has spread to his lungs. It is a rare form of cancer that mostly occurs in teenagers and young adults. The doctors have prescribed an aggressive treatment for Carson. Over the next few months, he will be in and out of the hospital going through Chemo, possible surgery, and radiation. If you are unable to attend but would still like to donate, please purchase tickets under the name of Katie Mattson or Dana Anderson and we will get them to a family that might not otherwise be able to attend!